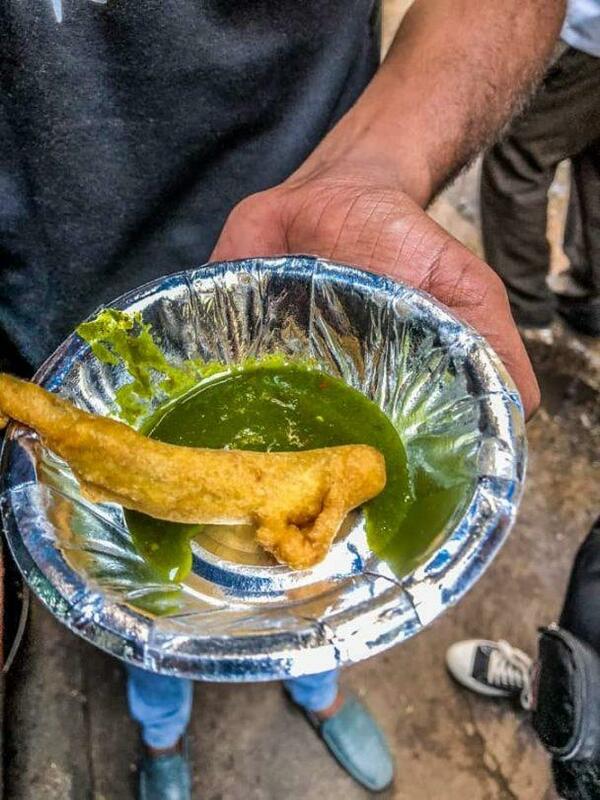 Old Delhi Street Food tours - How to become a Delhi food expert in a day. Whilst I might be sold on this saying, in theory, putting it into action is a whole different world. Eating in India was one of the things we were most excited about, but it came with a good dose of trepidation as well. For the stories of ‘Delhi Belly’ and other illnesses cannot be ignored, well not if you want to try and remain as healthy as possible. I’m not a naysayer when it comes to street food, having eaten my fair share in places such as Thailand and Vietnam. At the same time, I’m a realist so I wasn’t going to go out of my way to eat food that would have a high risk of making me sick either. So, having spent a week aboard the Golden Chariot luxury train in the south of India, where I didn’t need to be worried about my food, how would I get on in Delhi? Stirling had flown to Delhi after my train trip and so on our first day out together we wanted to get to know the food of Northern India better. Our solution? An Old Delhi street food tour with Delhi local Gajendra Singh Rathore from A Chef’s Tour. A man who when asked could he cook told me “he had been cooking since he was a small child”. “All Indian children know how to cook and we much prefer to do it all ourselves”, he said. We met Gajendra at the sacred tree (don’t ask me why it’s sacred), outside Exit 5 of Chandi Chowk metro station. It’s an easy place to find, and you can’t miss Gajendra when he arrives with his handlebar moustache and prominently branded “A Chef’s Tour” t-shirt. The food tour starts at midday and goes for about four and a half hours. It’s solid going for all of that time too, with not too many opportunities to take a real break. 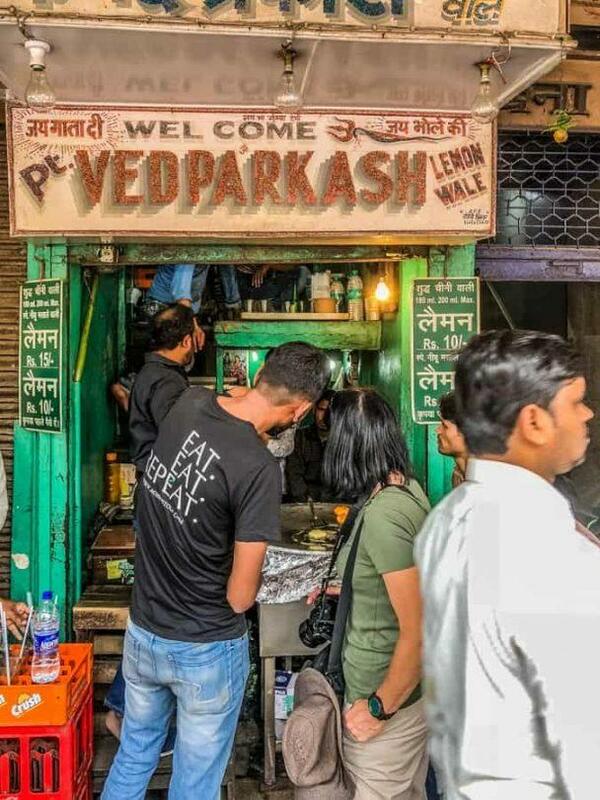 This is partly because there are so many foods to try (around 12 different food tastings), we cover a lot of ground, and it just always feels super frantic, given we are in the heart of Old Delhi. Our first stop was at the nearby Hindu temple to get a quick lesson on the Ganesha and to receive a bindi. The bindi is seen everywhere in India, although it can often be in different colours and sometimes lines. Whilst they are worn a little more liberally in modern society, there is still great significance placed upon it in the Indian culture. In a sign that this really was going to be a food tour full of food, we had barely had our bindi placed on our forehead and we were at our first stop of the day. One of the key tips when knowing if a street vendor is safe or not is by the number of locals who frequent it. If this was true, then Natraj Dahi Bhalla was just the place to eat from. At any of the really good street vendors, it is standing room only. Like everywhere in India, people push and shove to get to the front, standing so close to you that at times you can hear them breathing right in your ear. There’s no room for indecision here. The vendors quite often sell only one thing, sometimes a variety, but the customers know exactly what they want before they get there. The etiquette then seems to be that you get your food and move away from the counter so as to not inconvenience the next buyer (and so as to not get squashed!). However, they don’t move too far away, preferring to hover around in small groups, eating their food as soon as they can. Here we tried the Dahi Bhalla, an Indian chaat (savoury snack). Filled to the brim in a somewhat flimsy container, the blend of yoghurt, soaked lentils, tamarind and spices was a strange taste sensation. I tasted all the elements individually and picked up a strong salt flavour. Ganjendra informed us to “mix it up and eat it all together” which removed the salty tones but was still an unusual texture and flavour. It was also very sweet, I suspect from the yoghurt. Indians love sweet food though, something I found hard to come to terms with at times. This was a snack but it tasted like more of a dessert to me. 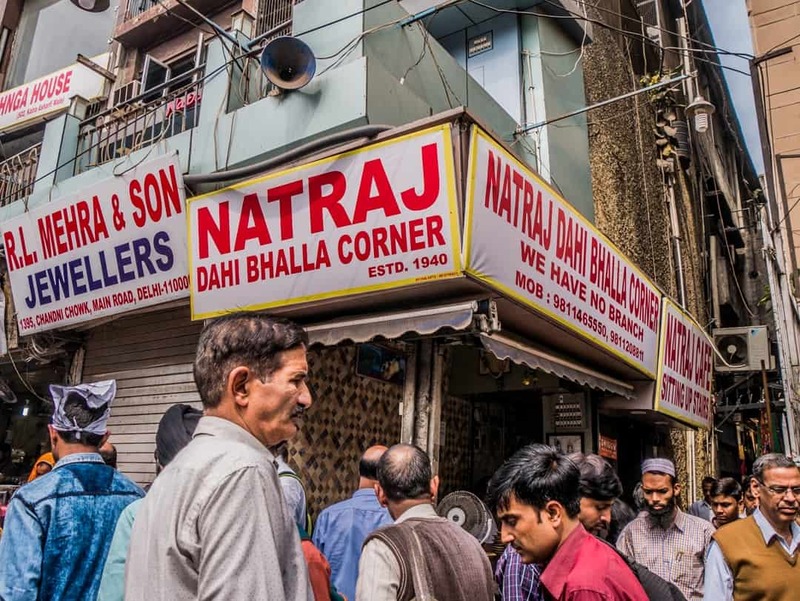 Natraj Dahi Bhalla has been serving this and Aloo Tikki (a potato curry) to its loyal customers since 1940, a trait we would see quite often throughout the rest of the day. The lassi is the popular drink of frothy, cold, watery yoghurt and is often served with spices and fruit. On a hot day this is quite refreshing. Mango seem to be the fruit of choice here for making lassi’s. If you are wanting to drink the best lassi, look for it being served in a traditional clay pot. According to our guide, the clay pot makes it taste better as they are PH neutral. Once used, the cups are smashed up and recycled. Our next stop is at “Old Famous Jalebi Wala”, occupying a corner spot that has been the home of this Delhi food institution since 1884. Operated by the same family for four generations, its speciality is the sweet, curly, doughnut-like jalebi. Best eaten hot, when they come straight out of the boiling ghee, they are first placed in a sweet sugar syrup, often mixed with spices. This sweet dish was probably the one I liked the best, although I couldn’t imagine eating any more than a few bites at a time. Anyone with a sweet tooth, however, would love this. The food tour isn’t just all about the food. In between the incessant honking of horns and general noise and trying to stay right behind Gajendra, we learn about the Town Hall, various mosques and important buildings of the area. It’s one of the huge benefits of being lead around by a local. This was one of my favourite parts of the tour. The Gurudwara Sis Ganj Sahib is a Sikh temple in the busy Chandi Chowk area. Here, there is also a kitchen that provides meals to between 20,000 and 30,000 people every day, for free! Volunteers run this “food factory”, cooking up gigantic proportions of rice, bread, lentils and soups for anyone who comes through the doors on a daily basis. People of all kinds are here for lunch when we visit. Don’t expect to just see homeless people here, or people down on their luck. People come here for the experience just as much as to fill their stomachs. The Sikhs welcome people irrespective of race, religion, caste or colour. No questions are asked, everyone is welcomed. As you can imagine, keeping a place like this running would require substantial donations and volunteer labour, so wasting food is not tolerated. The food tour takes us in and around many of the laneways. At first glance, you would think it’s easy to get lost. The tour takes place right in the busiest part of the day in Chandi Chowk. It feels as though the entire population of Delhi is here at times. The roads are crazy, but I love crossing the roads. It’s an adrenaline rush, and I just love being able to carve out my path in between the cycle rickshaws, the tuk-tuks and all manner of animals, people, cars and carts. I thought Vietnam was crazy but this place is insane! This time, it’s Gulab Jamun. Usually seen as round balls, Gajendra has decided to have us try a sausage-like style. It looks a bit ordinary and uninspiring. The texture is strange too., having been made from a dough that is formed from reduced milk solids. Rosewater, a polarising taste for many, is usually the key ingredient in the sugar syrup in which it is soaked. Other Indian spices like saffron and cardamom can also be added. Our timing here came just before Holi, the annual “festival of colours” and the colour activity in the streets is already starting to happen. One of the events that kids, in particular, like to participate in is throwing coloured powder and water from up above, catching unsuspecting people, especially tourists. Our guide warns us to be careful as we start to walk through the back lanes of the residential areas. He offers us a chance to avoid the streets altogether but we decide we’re up for the challenge. Besides, we really want to see what’s behind the craziness of the main streets. 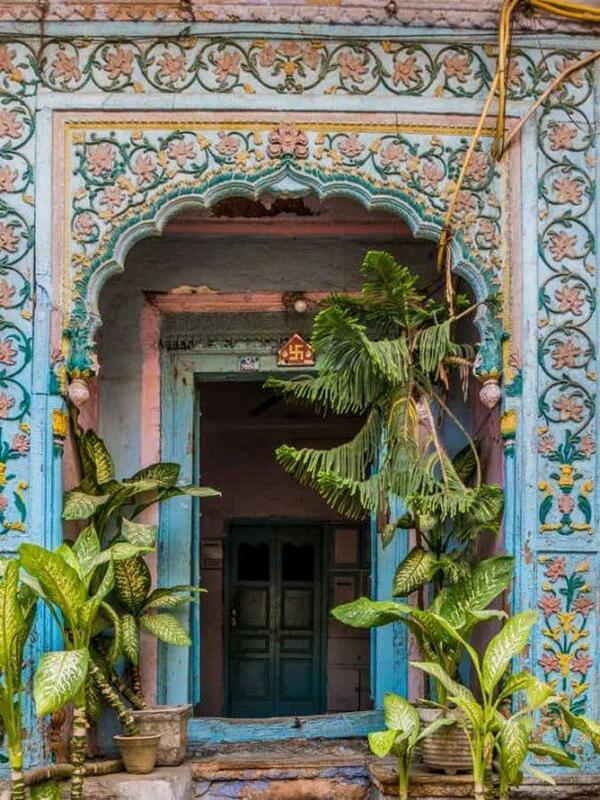 The havelis in India were symbols of status and wealth. Hidden away from the main areas of the city, they usually had a large main gate to seal off the area and several courtyards. Today, they are but a shadow of their former selves, with many in quite a bad shape, although their former beauty can still be seen. The food, as I said earlier, is never-ending, and all of the portions are quite large as well. On more than one occasion, I found a homeless person to pass off my leftovers too. It’s just irresponsible in a city like this to throw good food in the bin. A quick search around you will often find someone willing to take your food. It’s right in the heart of lunchtime when we find ourselves in Gali Paranthe Wali, the narrow laneway here that has wall to wall shops selling paratha. We settle into a sixth generation paratha seller who makes me make the hardest decision I’ve had to make all day. What do I want in my paratha? I decide on a pea one and a potato one because apparently, you can’t have just one! The parathas are served with additional condiments, making this quite a large meal. This was about the time when you start to hope it’s closer to the end than the beginning. Not because you are having a bad time, but because you don’t think you could eat another thing. Well, I’ve got news for you. It’s just getting started, with plenty more coming your way. With the paratha still heavy in my stomach we arrive at the “pink stand”, where a man makes pani puri. All over this area, you will see vendors with small balls piled high. These are the puri. Small, crispy balls with nothing inside. That’s where the pani, or water, comes in. A filling of chickpeas, potato, onion and spices is added into a pani and a flavoured water is poured over the top. Gajendra laughed at me as I tried to eat it delicately, taking a bite at a time. I needed to be more like an Indian and put the whole thing in my mouth! Pani puri needs really to be eaten quickly or else they get really soggy and not very nice to eat. Indians love their chilli, as do we but there are varying degrees of it. Take this large green chilli that came my way for example. They call this a pakora because it’s been covered in a batter and fried. Just quietly, I think it’s a way of trying to cover up that it’s a gigantic chilli. Anyway, we’re here to give everything a go, so the first bite was easy. The second bite was hotter and with more of the flavour of the chilli. As I took a rest, I looked into the chilli and saw the seeds and thought that it was time to give it up. Full power to everyone who eats this thing in its entirety and goes back for seconds. I really liked this dish too although again it was just too much for one person to eat along with everything else. The Aloo Sabji potato curry was tasty. The fried khasta kachoris used to scoop out the curry were good too. Another benefit of going on a tour such as this is you get exposed to places that you would never find otherwise. Up a non-descript set of stairs, we found ourselves on an upper floor looking directly across the road to the Town Hall we had seen earlier. 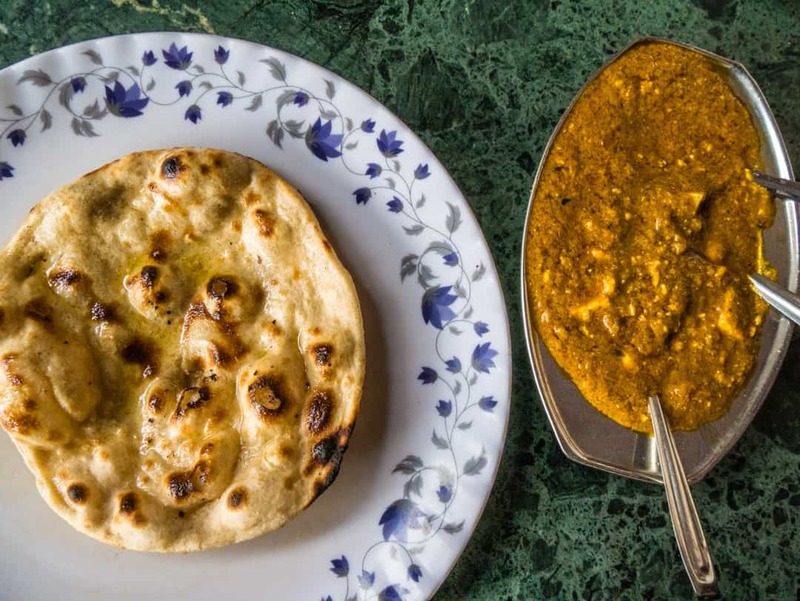 Here, in an almost secret restaurant known only to locals, breads were being cooked in the tandoor, chapati’s on the griddle and famous paneer masalas being served up. Some chose to stay to eat, others got their curry and bread in takeaway bags. No visit to Delhi would be complete without a visit to the spice market. Spices, teas, rice and beans of every kind are sold here, in small bags right through to enormous commercial quantities. Like the rest of the market area, it’s chaotic but it’s the smell that makes all the difference here. Take a few steps into the heart of the spice market, and a few sharp breaths, and you will be doing one of three things. You will be either gasping to take another breath, sneezing, or coughing. It’s indescribable how the smell of spice permeates the air so quickly and so thickly that it will render you almost incapable of walking another step without covering your nose and mouth. You can instantly see those who work here by the masks they wear as protection. We carried a bottle of water around with us all day, and water was also provided by A Chef’s Tour along the way. As a change from water, we tried the lemonade, with Gajendra opting for a masala lemonade where spices are added, whilst I had the simple lemon variety. So I found this to be a very weird, eclectic combination of ingredients. Wrapped in a betel leaf, with things like chocolate spread and Enterfennel candy, it has become more popular to eat a sweet paan than the traditional ones filled with tobacco. This one wasn’t to my taste at all. By the end of the day, I’d had enough. I couldn’t put another morsel of Indian food past my lips. And so it was that the falooda, an icy milk drink with spices, rosewater syrup and strangely, vermicelli noodles just had to be passed up. The streets of Old Delhi can take you on your own culinary journey, with its maze of laneways, shops and people offering food of every kind, often made from recipes that are generations old. 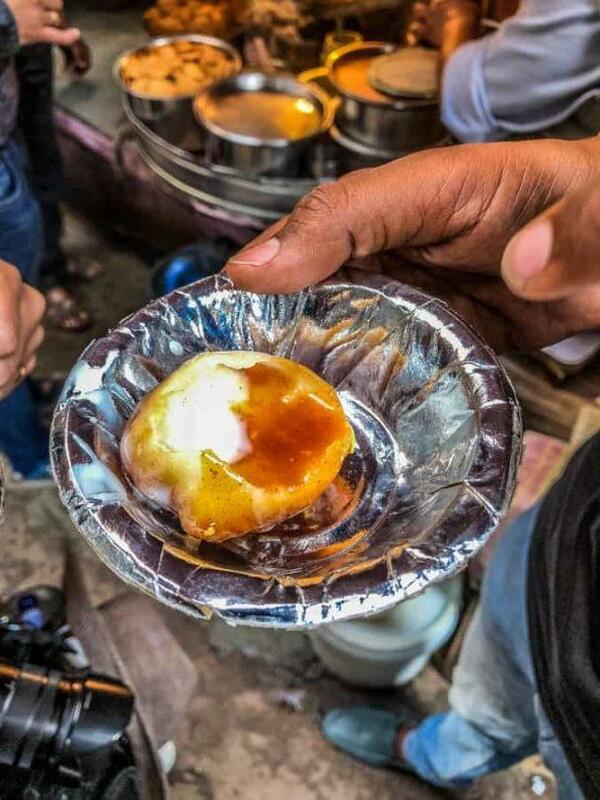 Or if this sounds too adventurous or a little uncertain, doing the Old Delhi Food Crawl with A Chef’s Tour is definitely the way to go. We loved it and it was a great start to our time in northern India, allowing us to learn about the foods we would see over and over again. 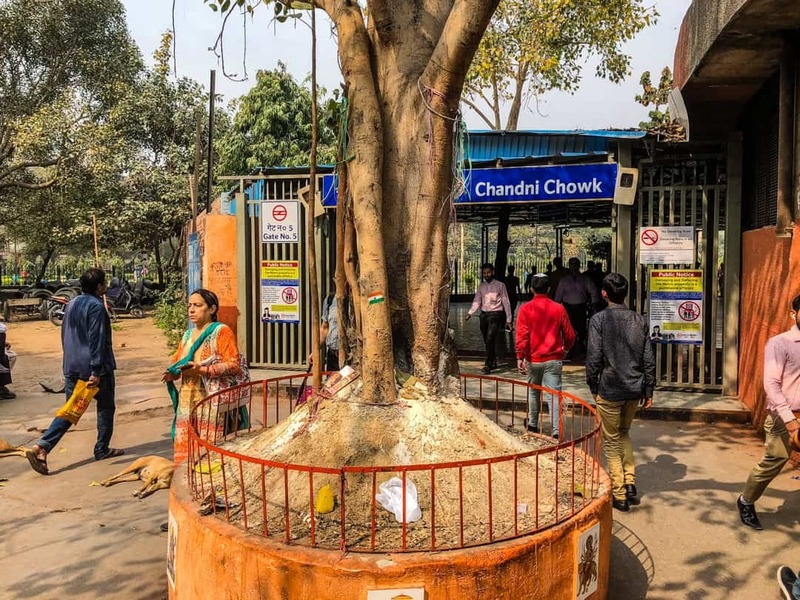 Make sure you understand how to get to Chandi Chowk metro station and the exit five meeting point. Chandi Chowk is a huge station with many different exits. Because these are group tours, try to get there at least ten minutes before the meeting time. It’s always annoying when people are late. Eat only a small amount for breakfast as the tour includes a lot of food. Wear comfortable clothes and walking shoes as there is a lot of walking. If you have any dietary concerns, just chat with the guide who is very flexible. If you are new to India, just be aware that this area is very busy with both people and road traffic. Even in the tight narrow laneways, don’t be surprised to find a fast-moving scooter or a cart being pulled at a reasonable speed. Also be vigilant of your belongings. Take as little as possible with you. Come with an open mind and be ready to try foods you may not have tried before. Everything you will eat and drink is included in the price of the tour. However, if you wish to purchase things (eg we bought spices from the spice market), you will need your own money. If this is your first time in Delhi, we’d recommend doing the tour early in your stay. It offers great insight not only into the food but the area, the culture, their customs and general way of life. Maximum eight people per tour. Tours run from 12 noon until approximately 4.30pm. Guides are licensed and English speaking. The food tastings are 100% vegetarian. Tips are not included in the price. This is at your discretion. Bookings are made and paid for online. An email is sent to confirm and will also note details of meeting times, locations etc. Street vendors visited may be varied depending on their availability. Looking for a comprehensive guide to India. Check out an expat’s Guide to India by clicking here. Previous Post: « Is taking a luxury train in India really luxurious and is it worth the pricetag?